RiverEdge Park is the centerpiece of Downtown Aurora an all-ages attraction with opportunities for outdoor exploration and educational experiences. Hampton Inn & Suites Aurora, located near I-88 approximately five miles away from downtown, offers easy access to the citys newest park. 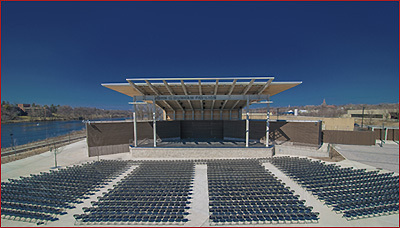 The park boasts event space, garden market, outdoor performance venue, environmental center and views of the Fox River. RiverEdge Park is the cultural heart of Aurora, hosting a number of annual events, festivals and concerts. Stroll the banks of the Fox River, check out an exhibit on the nearby wetlands, or walk the beautiful Wilder Promenade before heading back to the spacious accommodations at Hampton Inn & Suites. Hampton Inn & Suites, a conveniently located hotel in Aurora, Illinois, is just off I-88 and is only 20 minutes from RiverEdge Park.